IT managers often share common goals, including a need to modernize their storage infrastructures, improve quality of service and contain costs while simultaneously maintaining legacy systems. New storage software and system providers can help stakeholders build easier-to-manage, more scalable and efficient storage infrastructures. Many organizations are evaluating technologies that will drive efficiency, such as higher-performing and more automated storage, cloud-based solutions, and input/output (I/O) products that allow for proactive problem avoidance and increased resource utilization and optimization. 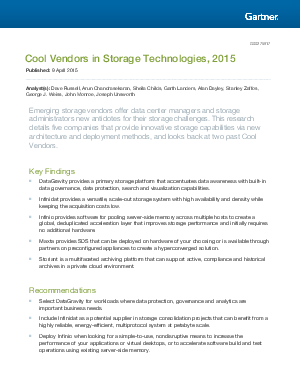 This research details five emerging vendors that can assist organizations in meeting their storage modernization and cost containment initiatives.